View of the Northern Lights from Camp Ripan in Kiruna. Part of having a perfect vacation in Sweden is staying at the perfect hotels in Sweden. We spent two weeks traveling through Sweden, starting in Sweden’s capital city Stockholm for history, then spending time in Swedish Lapland hunting for the Northern Lights and enjoying outdoor winter activities, stopping in Gothenburg in West Sweden for seafood, and finishing for one last night in Stockholm before heading home. During our travels through Sweden, we stayed at five beautiful, comfortable, and unique hotels in Stockholm, Jukkasjärvi, Kiruna, and Gothenburg. Miss Clara by Nobis is a first-class hotel located in an Art Nouveau building erected in 1910 which used to house a girls’ school. Arteneum girls’ school was first run by headmistress Miss Clara, from whom the hotel gets its name. All 92 of Miss Clara by Nobis’s rooms face outwards towards Sveavägen Boulevard. I would describe the rooms as having functional elegance. Our deluxe room was expansive with dark parquet floors, high ceilings, and tall windows looking out towards the boulevard and Adolf Fredrik Church. We had two bathrooms, one which was small and just had the toilet and a sink, and the other large with a sunken bathtub, a vanity, and a large walk-in shower. The large marble bathrooms even have heated floors, a luxurious addition which feels great both in the morning when stepping in and out of the shower and in the evening after walking around Stockholm all day. The rooms provide multiple ways to relax with a window seat, a chaise lounge, and a unique design of a chair back bolted to the foot of the bed along with a laptop lap desk in case you need to get a little work done. At street level, there is a restaurant, bar, gym, sauna, and relaxation lounge. In the morning a generous breakfast buffet is served in the bar and restaurant serving everything you could possibly want including eggs and meat, yogurt and granola, fruit, smoothies, and thin buttery waffles fresh from the waffle maker, perfect with a dollop of butter and a side of lingonberries. Be sure to ask the friendly staff for a map of Stockholm and suggestions. Petter, who was manning the front desk, took the time to explain the layout of central Stockholm and point out all the places we might want to visit, from the palace and museum to interesting neighborhoods, shopping streets, and popular restaurants. We only stayed in Stockholm’s Nobis Hotel for one night, but what a luxurious night it was. Nobis Hotel is twice the size of Miss Clara by Nobis, with 201 rooms, and is located in on Norrmalmstorg Square in two interconnected 19th-century buildings. Nobis Hotel is a luxury hotel, but the designers wanted to make a modern, edgy, and contemporary luxury hotel without the traditional luxury hotel features. They envisioned a hotel that feels warm and homey rather than opulent and over-the-top. Our room was large and spacious with high ceilings, large windows, dark wood floors, and muted accents which created a relaxing feel. Through the windows, we could see Norrmalmstorg Square. The lounge is a beautiful bright space in the enclosed center courtyard of the hotel. The ceiling has two glass domes which let in natural light and are surrounded by bright colorful tiles of blue and green. The walls surrounding the courtyard have rounded towers with scattered small windows, making it look almost like a castle surrounds the lounge. The lounge is a comfortable place to hang out, like a living room, where guests can relax and enjoy snacks and spirits. While the designers wanted to stay away from the expected luxury touches like velvet and gold, they still managed to sneak a bit in with the Gold Bar where guests can enjoy a cocktail. Nobis Hotel also has Caina Restaurant, which serves Italian cuisine, and Bistro, a more casual eatery also offering Italian dishes. Swedish Lapland is a popular destination in winter for travelers who are hoping to see the Northern Lights. The most well-known hotel in Swedish Lapland is the original and world-famous ice hotel of Sweden, ICEHOTEL Jukkasjärvi. Because the ICEHOTEL is such a unique hotel, I’ve written an entire article on what it’s like to stay in Sweden’s ice hotel. We stayed in Swedish Lapland for four nights to increase our chances of seeing the Northern Lights. We spent two nights at the ICEHOTEL then moved to Camp Ripan in Kiruna. While staying at the ICEHOTEL is a bucket list experience, it was also fun to stay in a hotel within the mining town of Kiruna. Plus, Camp Ripan is a bit easier on the pocketbook. Despite the name, Camp Ripan is not a campground, which is a good thing since foreign travelers to Kiruna are more likely to be visiting in winter than summer and wouldn’t want to be camping in such freezing temperatures. Camp Ripan’s main building contains the lobby and restaurant, a second building houses the spa, and then there are also strings of connected cabins where guests stay. Camp Ripan does also offer camping during the warmer months. The cabins are very modern and simple but accented with bright touches like green couches and pillows. The wood floors and furnishings are light wood. During the winter, windows look out onto the snow, usually marked with tracks from small animals. My favorite feature of Camp Ripan is the spa. Every day we were out in the cold, either enjoying winter outdoor activities, like dog sledding, or exploring the town of Kiruna. Spending an evening at the Aurora Spa was so relaxing! After changing into a swimsuit and robe in the dressing room, you enter the spa by walking through a rock covered hallway with water running down the walls and along the walkway like a stream. There are a few different saunas to choose from with different scents promoting relaxation. Outside of the saunas are showers to rinse off under, with a choice of a standard shower or the more traditional bucket of ice cold water. There’s an indoor pool or, for the very brave, a heated outdoor pool surrounded by the snow outside. Camp Ripan also has a very good restaurant, which is White Guide rated and serves seasonal food inspired by the Swedish, Sami, and Torne Valley Finish cultures. One of the main reasons we chose Camp Ripan as our hotel in Kiruna is because even though Camp Ripan is in town, it is located on the outer-edge of town, which I hoped meant there would be less light pollution if the Northern Lights showed themselves. It turned out this was a good hunch. On our last night at Camp Ripan, we left the spa to find the Northern Lights dancing in the skies. Just behind the hotel, near the cabins, is an open area that is also the beginning of Midnattssolstigen, Midnight Sun Trail. Just steps away from our cabin we were able to set up our tripods and get some spectacular shots of the Northern Lights. The lights in the park turned off soon after the aurora borealis started, so there was very little light pollution, though the light coming from the hotel provides the perfect amount to take Northern Lights selfies. Hotel Bellora is a boutique hotel in the center of it all, right on Gothenburg’s main street, Kungsportsavenyn. Many great restaurants are within easy walking distance of Hotel Bellora, including Gothenburg’s newest Michelin-starred restaurants. Hotel Bellora also has two restaurants of its own, Ristorante Bellora and sister restaurant Brasserie Lipp where breakfast is served. Rooms are small and functional with city views. Floors are dark hardwood, walls are covered with wallpaper that looks like the buildings of the Greek islands, and little bookshelves by the bed hold books of all different genres in case you forgot to bring reading material. A nice extra touch was the bottled sparkling water and coffee press. Just across the hallway from our room was a balcony looking over the main street below. I was amused by a sign in the bathroom listing items the front desk could supply for guests who had forgotten any of them. Ear plugs, mouth wash, and sewing kits are provided free of charge, but they’ll also provide items like boxers and socks for a small fee. 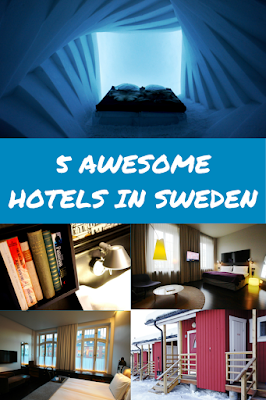 If you’re planning a Swedish holiday, you won’t go wrong by staying at one or all of these hotels in Sweden. Thank you to all of the hotels listed in this post for partnering with us to make this post possible. As always, all opinions are my own.